The Marché de Noël is a holiday feature of the Chicago French Market! Rotating visiting artisan’s selling unique gift items will display and sell wares under the Eiffel Tower in the market daily from 10 a.m. to 7 p.m. through December 24. Modeled after French Christmas markets, Marché de Noël provides a fantastic atmosphere and unique shopping options, not to mention the opportunity to replenish wine stocks for the Christmas season. The Marché de Noël at the Chicago French Market also offers shoppers the opportunity to do all their holiday shopping in one location. Artists will sell jewelry, kids’ items, wall décor, photographs, toys and many more gift options. A variety of new items will be featured at the Chicago French Market during this time as well. The Marché de Noël is believed to have begun in Dresden, Germany in 1434 under the reign of Frederick II of Saxony. The Marché de Noël first began in France in the city of Strasbourg where it is still held today. It has continued ever since in France and in many other cities throughout Europe. CHICAGO—Vanille Patisserie, one of Chicagoland’s finest French gourmet pastry wholesalers and retailers, has been acquired by an investor group headed by Sophie Evanoff. Ms. Evanoff, a graduate of Chicago’s internationally-renowned French Pastry School, and the University of Michigan, has worked in operations, production and marketing managerial capacities with several area gourmet confection and pastry companies. “The specialized gourmet pastry market has remained strong and viable despite the economic downtown in the Chicagoland area,” Ms. Evanoff said. “Consumers have always enjoyed the experience of a gourmet treat, whether at their favorite restaurant, from a specialized shop or at home,” she noted. Vanille Patisserie provides luxury desserts to a number of Chicago’s finer restaurants and hotels. In addition, it has retail outlets in Lincoln Park, 2229 N. Clybourn and in the West Loop FrenchMarket. It also serves an extensive client base via its internet operation www.vanillepatisserie.com. In addition to its wholesale and retail operations, Vanille Patisserie provides specialized catering and wedding cake creations. Information about the company and its products are available at www.vanillepatisserie.com or at 773-868-4574. KaiSushi debuts at the Chicago French Market this month! The restaurant’s chef/ owner, John Tsendsuren, was born and raised in Mongolia. After graduating from high school he moved to United States in 2000. While Tsendsuren was going to college, he began his culinary career by working in the house kitchen of a small, family-owned Japanese restaurant in Fort Myers, Florida. He spent four years learning the fundamental skills of Japanese cooking and art of sushi. In 2005, John decided to move to Chicago and found success while continuing to master his craft at well- known restaurants in city, including Nomi at Park Hyatt, Sunda, Kamehachi and Ra Sushi. Most recently, Chef Tsendsuren opened his own restaurant in West Town, KaiSushi. With this achievement under his belt, John decided to open his second location in The Chicago French Market. Tsendsuren plans to open mid- December by offering the freshest seafood, all rolled by hand. A small seating area/counter will allow his guests to enjoy conversation, artistry and amazing sushi. For his customer’s convenience, Kai Sushi will also offer delivery. Thirteen-year-old Gabrielle Browdy performs at the French Market from 4-7 p.m. While she may be young, Gabrielle is an accomplished and talented musician who is comfortable singing a variety of styles. Beat the rush-hour crowds and wind down with her performance at the French Market. For more information on Gabrielle Browdy and her music, visit http://gabriellebrowdy.com. Join the well-known Chef Carole Jones at Raw (131 North Clinton Street Chicago; 312-831-2729) from 6:30 to 8:30 p.m. as she teaches how to prepare a raw and vegan holiday brunch for your friends and family. The menu will include: Bacon, Eggs and Biscuits, Festive Waldorf salad and Goji Berry and Lucuma Cookies. The event is part of the Vegan Food Prep Class Series. Purchase your tickets online for $50 at www.chicagorawfood.com. Folk musician Steve Justman joins the lunchtime crowds from 11 a.m. to 2 p.m. December 7. Justman hails from the Chicago-area and specializes in performing Americana music. He has performed in many of the best acoustic venues in the Chicago area and is excited to return to the French Market. For more information on Steve Justman or to listen to his music, visit http://www.stevejustman.com. Have you ever been to Europe or Asia and experienced a Night Market? If not, you can enjoy one right in the heart of the city! The Chicago French Market is hosting their first Night Market Thursday, December 8 from 4 to 9 p.m. The lights will be dimmed and little white lights will be stretched across the aisle to light your way through the market. Come enjoy dinner and drinks while exploring the market. This is your chance to try foods you haven’t had before. 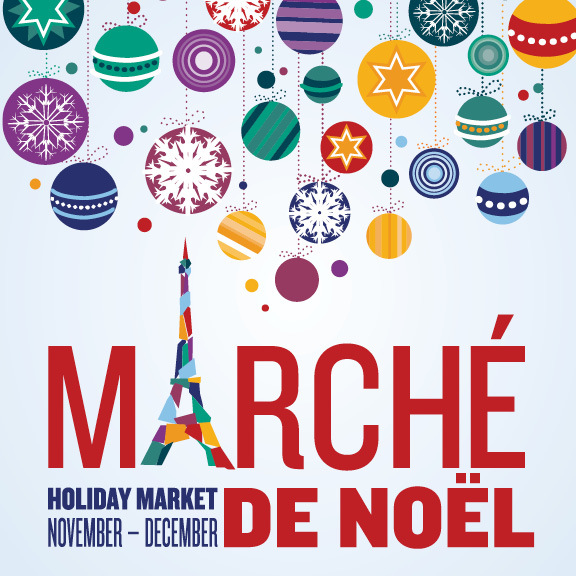 There will be live music to set the mood, and it’s a great opportunity to shop Marché de Noël. DeanMilano is a songwriter, musician, and the author of The Chicago Music Scene: 1960’s and 1970’s and will revive the spirit of that time through his music at the French Market from 4-7 p.m. Dean will sing classic songs and play his bass guitar. Relax and enjoy his musical skills with dinner from the French Market. For more information on Dean Milano, visit http://www.myspace.com/deanmilano. Create holiday memories for you and your kids Saturday, December 17 from 11 a.m. to 2 p.m. Decorate holiday cookies and enjoy live holiday music. Santa will also be making a special appearance! This event is free. The French Market will host a cooking demonstration and tasting with Chef Jason Heiman of Pork Shoppe from 12-1 p.m. Tuesday, December 20. He will demonstrate several dishes, and a sampling of his creations will follow. It’s the perfect opportunity to ask one of Chicago finest chefs your culinary questions. Chef Jason Heiman is a 20 year veteran of the restaurant industry. 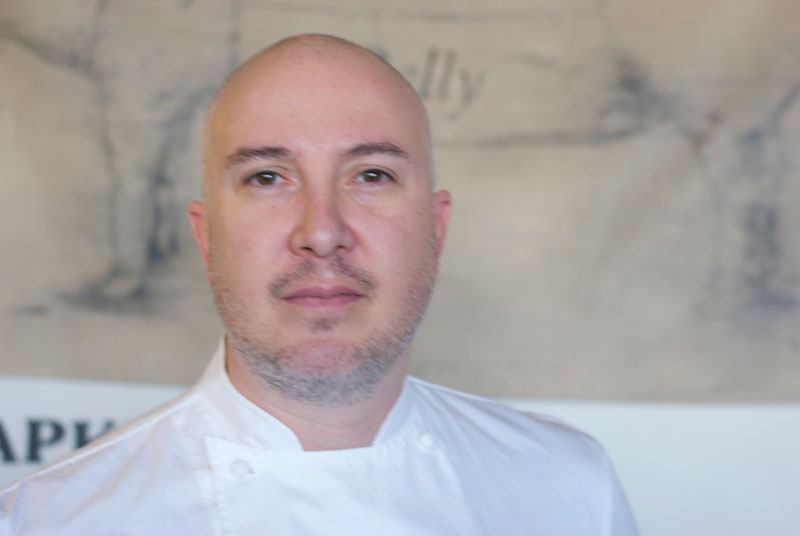 Prior to opening Pork Shoppe, he was at the helm of Tizi Melloul, Sous Chef at the eponymous Crofton on Wells and Sous Chef at the Palm Restaurant in both Chicago and Denver. While pursuing a degree in fine art and design, he was working his way through some of Denver's best kitchens. With his interest piqued, he began attending culinary school at the Institute of Art in Denver. Upon graduation, he headed to Paris and attended the prestigious Cordon Bleu. Jason enjoys putting a new twist on classic dishes with an emphasis on freshness, balance, and presentation. At Pork Shoppe (2755 W. Belmont, Chicago, IL 60618; 773-961-7654), he combines traditional elements of barbecue cooking incorporating some mild fusion elements from every part of the country. Pork Shoppe also uses natural, locally sourced, farmed meat. For more information, visit http://www.porkshoppechicago.com. Enjoy traditional accordion music over your lunch break! Accordion player Pat Spaeth will delight as she plays classic accordion tunes from 11 a.m. to 2 p.m. An accomplished musician, Spaeth is well-versed in many international music styles. Pick up lunch at the French Market for a European experience! Prolific accordion play Pat Spaeth will share her musical expertise from 4-7 p.m. at the Chicago French Market. Avoid the hectic rush hour and listen to her accomplished playing. Accordion music is a French tradition that Pat is delighted to share at the French Market. Here’s a breakdown of what’s coming to Chicago French Market this December! City Fresh Market has made it easy for you to host parties this holiday season! City Fresh Market can create custom cheese and deli trays for all your entertaining and catering needs. Pricing is based on what is included on each tray. City Fresh Market also added ready-to-eat barbeque and buffalo wings for any size party. If it’s a gift you need, consider a fresh fruit or gourmet food basket. It’s ideal and they start at only $15.00. Enjoy the perfect combination of decadent Italian drinking chocolate infused with peppermint, espresso and steamed milk. Crowned with whipped cream and artisan crafted Peppermint Bark! Enjoy the perfect combination of decadent Italian drinking chocolate infused with peppermint and steamed milk. Crowned with whipped cream and artisan crafted Peppermint Bark! Les Fleurs has stocked coolers with seasonal floral treasures. 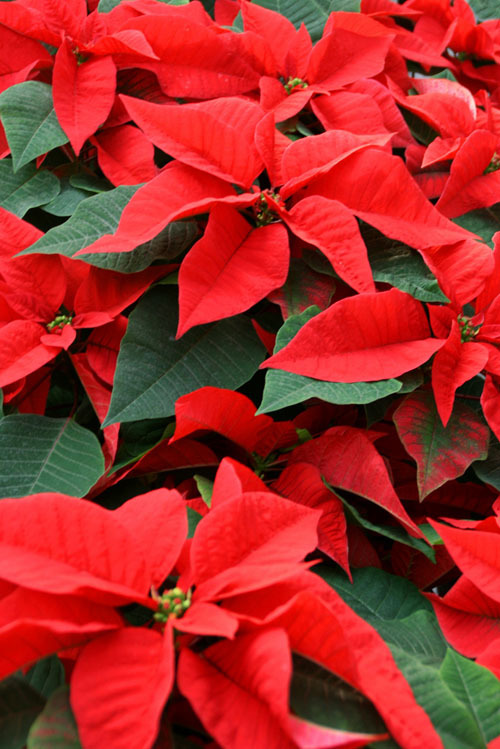 From poinsettias to arrangements adorned with fragrant holiday greens, Les Fleurs is the place for you to find help decorating for the holidays. Choose from custom floral arrangements, wreaths and swags, or special order evergreen roping for your mantels or banisters. Loop Juice (formerly known as the Juice Bar) is celebrating their 2nd year anniversary Thursday, December 8, with 15% off from 5-9 p.m. The have also expanded their menu selections. Stop by to enjoy their Salad Bar, Homemade Jams and Soups and Dried Fruit Chips. Three and Five Day Cleanses are available, along with an expanded juice and smoothie menu. Pastoral Artisan Cheese, Bread & Wine’s new catalog has been released with thoughtfully composed gifts, featuring small batch cheese, wine & accompaniments, sourced from celebrated local artisans and masters of classical traditions abroad. The golden rind has been washed in champagne brandy and envelopes a creamy, silky smooth, ivory interior. For a dynamic presentation, pour a splash of Champagne into the cheese’s top crater and watch the bubbles dance. Visually stunning and delicious! The blend of three milks makes this Northern Italian treasure flavorful and rich with hints of crème fraiche and sour cream. The delicate rind protects a deliciously creamy interfacing and slightly earthly, luscious interior. One of our highest quality goudas, these wheels are aged 2 years and hand-selected by Essex Street Cheese company. Notes of caramel and hazelnut jump out from amongst the multitude of flavors. Each delicious morsel of this crumble, aged cheese has velvety, melt-in-your mouth texture with a delightful crystalline crunch! This cheese is the world’s only hand-made, raw milk Stilton. A rare example of raw milk blue cheese in England Stichelton is made by gently coercing the organic milk into curds with only a small amount or rennet and starter cultures. The delicate curds are then hand-ladled into traditional English blue cheese moulds where they ripen into wheels of rich, creamy blue cheese with an earthy natural rind. The spice from the blue mold is balanced with notes of toasted nuts, cool butter and a caramel-like sweetness. Hints of sweet pine, wild berries, hazelnuts, morels, and ripe pears frolic together in this very rare blue. Produced only in summer, wrapped in pear brandy-soaked grape leaves, and cave-aged up to one year, enjoy this special treat when it becomes available. It is one of the only American cheeses available in Europe for our friends across the pond to enjoy! You may not find tomato juice or vodka in this jar, but you will find the spices and enough Stu’s sour pickle juice to make the best bloody mary you have ever had. Each little jar has all the pickle and pepper you need to make 4 pints of bloody mary. Just add a pint of tomato juice and vodka to 2oz of this sour sauce. Pastoral is the exclusive retailer for this delicious Bloody Mary mix created by a former Pastoral cheese monger. Pastoral recommends you use Death’s Door Vodka, locally produced on Washington Island, Wisconsin. Wine Spectator gave this sparkler a very stellar rating, your mother-in-law will love it and your boss will think you’re a genius when he tastes it. So grab a flute, open your mouth, free your mind…and make sure you have a Picolo handy! Stay in for New Years and enjoy a lovely bottle of L. Mawby Sparkling Blanc de Blanc with farm raised sturgeon caviar from Italy. Each tin is Friend of the Sea certified and labeled with traceable information on its sourcing and production. Crisp and clean Blanc de Blancs, made in the Methode Champenois, dances on your tongue and mingles with the delightfully playful pearls of caviar. Picolo, a triple-crème button of cheese, pays a palate pleasing tune. Produce Express is stocked with seasonal harvest. 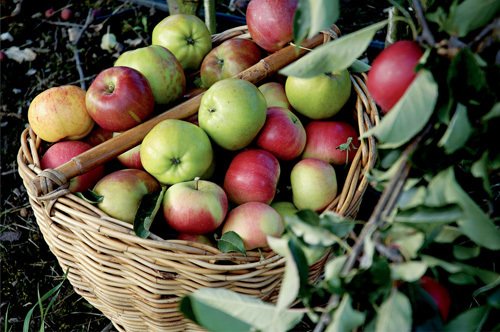 Choose from several varieties of apples, squash and sweet potatoes, just to name a few. Produce Express is an Illinois farmer, and the majority of their items are from their downstate farm or other local farmers. You can’t get any fresher than that! Provo’s Village Bake Shop is busy in the kitchen so you don’t have to be! Choose from traditional Pecan, Apple, Apple Caramel, Pumpkin, Chocolate Silk, Banana Silk and Key Lime Pies or an Old Fashioned Yule Log Cake. Also available are traditional Sugar, Almond Crescent, Gingerbread and Butter Cookies and traditional Kolachki’s. Saigon Sisters has created two amazing gift-giving items for you. Choose from a Vietnamese Coffee Kit (Ca Phe) consisting of Café du Monde coffee, 2 Phin Filters, 2 Stainless Steel glass mugs and a can of condensed milk for $50.00. Looking for the perfect gift for every foodie on your list? Saigon Sisters has created an amazing Vietnamese Spring Roll/Cookbook Kit consisting of a Vietnamese Cookbook, Spring Roll Kit and Pho Spice Sachet, packaged in a Saigon Sister trademarked straw bag for only $45.00. Superior Nut and Candy recently added gift boxes and tins filled with assorted nuts and candies. These boxes and tins are just right for teachers’ gifts, gifts for co-workers or just someone you want to thank. Most of them are under $10.00. Sweet Miss Giving’s will be featuring all your holiday favorites. Choose from Peppermint Brownies, Chocolate Peppermint Cupcakes, Pumpkin Cheese Cake, Turtle Cheese Cake, Ginger Molasses Cookies and Cherry Brownies. You will be the model hostess or guest when these treats are put out to enjoy. Vanille, Inc. will be creating two traditional French cakes this holiday season. The Bûche de Noël is a rolled holiday cake with decor like a Yule log. There are three available flavor combinations: Chocolate Cake with Fudge Ganache topped with Coffee Buttercream; Red Velvet Cake with Cream Cheese Filling and Buttercream frosting and Vanilla Cake with Raspberry Mousseline and Buttercream frosting. These cakes are $45 plus tax, and each serves 8-10. Vanille, Inc. is also offering classic Galette des Rois, an Almond Cream baked in Puff Pastry to celebrate the Epiphany. Baked inside each Galette is a small, collectible porcelain trinket called a fève. Whoever gets the slice with the fève is crowned King (or Queen) for the day. The cake also comes with a paper crown. Cakes are $32 plus tax and serve 8-10. What are you doing for brunch this weekend? Celebrate the Holidays with Kurman clients!